Mumbai RTO seizes famous Bollywood villain's Range Rover: Here's why! Mumbai RTO seizes famous Bollywood villain’s Range Rover: Here’s why! You may be Bollywood’s biggest villains but you still don’t mess with RTOs. 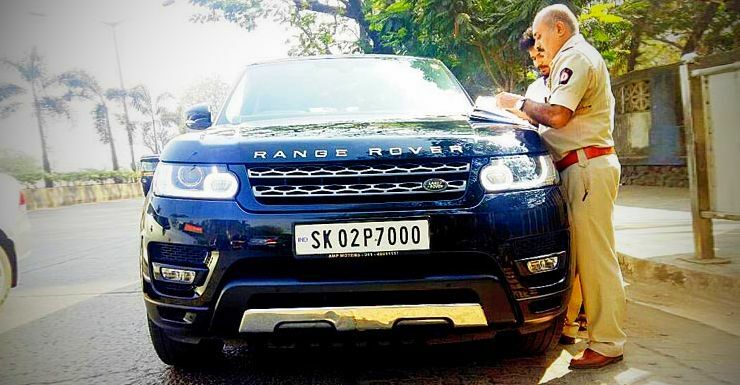 A swanky Range Rover luxury SUV was seized by the Mumbai RTO for road tax evasion. And the Bollywood biggie in question had to pay a massive fine (which included the evaded road tax) before he could get his SUV back. On February 13th, a day before Valentine’s, the Mumbai RTO’s flying squad swooped down on Danny Denzongpa’s Sikkim-registered Range Rover SUV. Denzongpa’s SUV was one of the 400 other luxury cars that the flying squad has seized in a short while, for road tax evasion. The siezed Porsches, Range Rovers, Audis and Mercs were released only after the road tax was paid. In many cases, the cars continue to rot at RTO impounds as road tax hasn’t been paid yet. 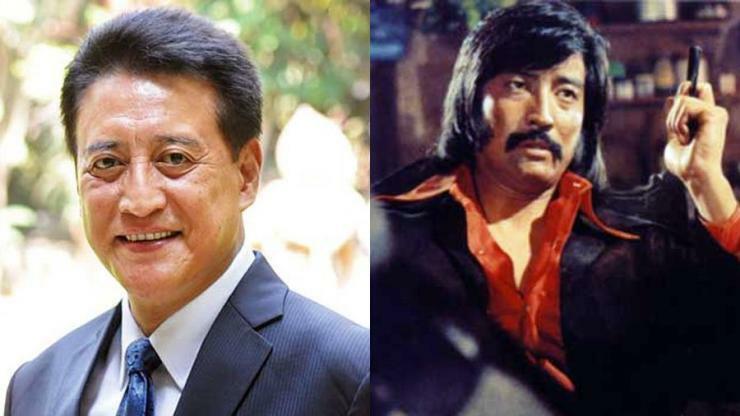 Danny Denzongpa, an actor who’s known for his villainous roles in many a Bollywood mega film such as Agneepath and China Gate, had to pay no less than 29.56 lakh rupees as a fine for evading ‘Maharashtra road tax’. The veteran of over 200 movies had registered his car in Sikkim but was found plying it in Maharashtra for more than 12 months without paying the latter’s road tax. RTO authorities released the actor’s SUV after he paid the fine. Denzongpa can now freely use his Range Rover in the state of Maharashtra. We have a flying squad that keeps an eye out for vehicles carrying registration from other states. On February 13, we found Danny’s car with a Sikkim number plate. When he was unable to produce a receipt of the Maharashtra road tax payment, we took over his Range Rover and kept it at the Andheri office. His driver arrived yesterday and paid the quoted amount, following which the car was released. In this case, it amounted to Rs 24.23 lakh, along with a yearly interest of Rs 5.33 lakh, totaling Rs 29.56 lakh. Some dealers misguide customers, telling them they will work around the rule and have the vehicle registered in another state. But this is illegal. How does this ‘out-of-state car road tax rule’ work? Let’s assume that you’re moving from Delhi to Mumbai. You can drive your Delhi registered car in Mumbai for a period of 11 months without paying any road tax. If you intend to drive your Delhi registered car in Mumbai beyond 11 months, you need to pay the Maharashtra road tax, which will be calculated on a pro-rata basis, depending on the age of your vehicle. So, two road taxes, one in Delhi and one more in Mumbai? Not exactly! Once you pay road tax of a different state, you get the option of registering your vehicle in that state, in this case Maharashtra. When you do this, you’re essentially surrendering your older registration number, in this case the Delhi number, to the Delhi RTO and getting back the road tax you’ve paid to the Delhi RTO. Then, why don’t people do this? The big incentive to cheat. Road tax rates vary from state to state. For instance, some states levy only 5 % of the car’s value as road tax while others levy up to 20 %. So for a 1 crore rupee car, you’ll pay a road tax of 20 lakhs if you register it in Mumbai, and only Rs. 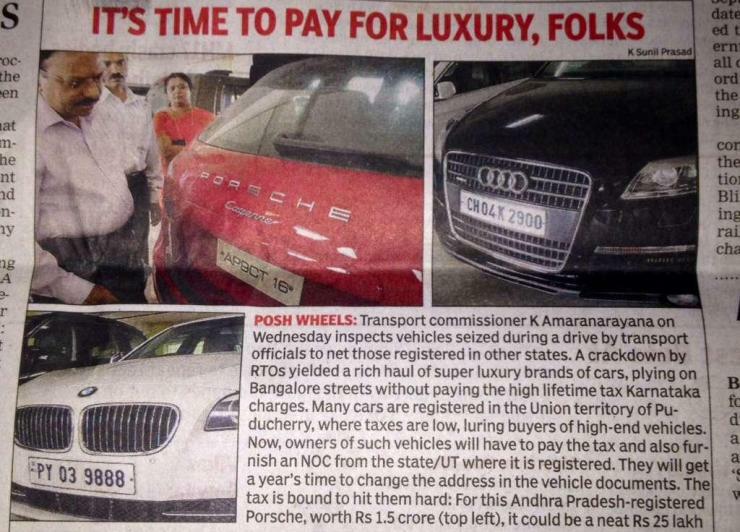 55,000 if you register it in Pondicherry (Yes, Pondicherry levies a flat, lifetime road tax of Rs. 55,000 on cars costing above 20 lakhs). This disparity makes owners register their high end cars in states where the road tax rate is lower, but drive them in states where the tax rate is higher. This is why you find a lot of expensive, luxury cars plying in Mumbai (where the tax rate is about 20 %) sporting registration numbers from Daman, Pondicherry or Jharkhand (where the tax rates are less than 5 %). There are touts who arrange for such registrations despite the owners not having address proof in the state where road tax is cheaper. Complicated process to get back road tax refund. RTOs are hot beds of corruption and red tape. This makes it difficult for a car owner to get back the refund after surrendering the original number and registering the car in a new state. So, most car owners avoid the expense and hassle of re-registering their cars in the new state they move to.